To cure boils 202 Eat shred Rosemary with bread and butter often and apply wheat flour and honey mixd. Bellies swelld in Children Apply fry-d worm-wood with fresh Butter. Drest for 3 nights. Breath short or Asthma R Turmerick Liquorice. Brimstone Elecampane Roots. an. 2 pennyworth mix them with honey take it morning and Evening. 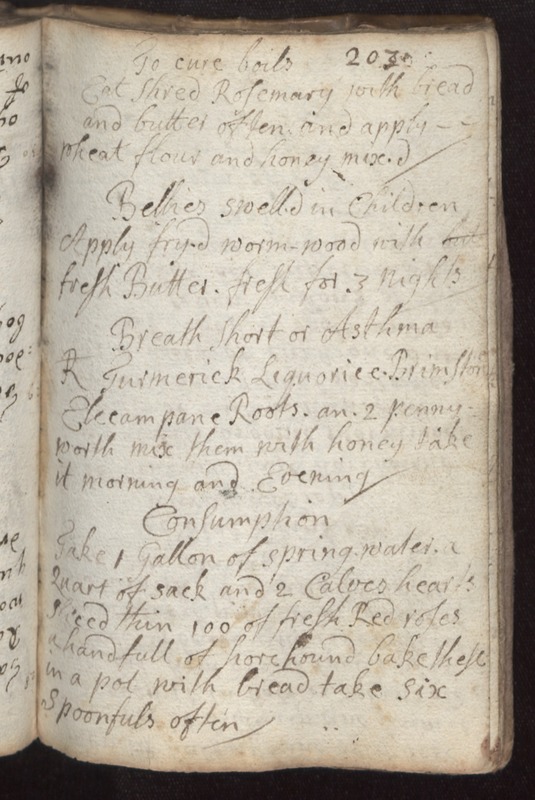 Consumption Take 1 Gallon of spring water a Quart of sack and 2 Calves hearts sliced thin 100 of fresh Red roses a handfull of horehound bake these in a pot with bread take six spoonfuls often.